The under-the-radar delivery spots that’ll take your game day to the next level. Taqueria Diana isn't really a taqueria. Or at least it shouldn't primarily be known as such. The name is factually accurate - tacos are indeed made here. But in spirit, it's not a taqueria. This is a temple to the holy San Francisco burrito. Pray before it, lest you be forsaken. Too often in this city do we come across lost souls - those who worship false idols, elevating mediocre tacos to heavenly status. And yet they know nothing of the glory of a true burrito from the West, filled with al pastor and guacamole and unconditional love. To those people we say, if you cannot make it to the promised land, let Diana be your New York shepherd. For it is she who will make you a true believer. We have been lucky enough to witness the almighty Mission burrito with our own eyes (and mouths) on many occasions, and we've come here today to testify to Taqueria Diana's legitimacy. This burrito is who it claims to be - a prophet sent from the sacred streets of San Francisco, here to bring us all salvation. No longer shall you search for satisfaction amongst impostors, only shall you know true devotion. It is pure and it is good and it will fill your heart and stomach with warmth - mostly from pork and salsa. Now go forth and spread the good news. Tell the world of this burrito on high, and also probably mention the nachos. He hath also given to all men chips and melted cheese. You want it al pastor, you want it loaded with everything, and you want to make sure you don't have another meal planned for about twelve hours. This thing is going to put you down and take you to heaven, also known as a mid-day nap on your couch. You are going to have a hard time convincing me that there are better nachos in New York City. This pile of chips and cheese and beans and other glorious Mexican things will satisfy even the most grande of appetites. As a matter of fact, you may want to find a tarp to throw over whatever you don't finish so that you can come back to it tomorrow. 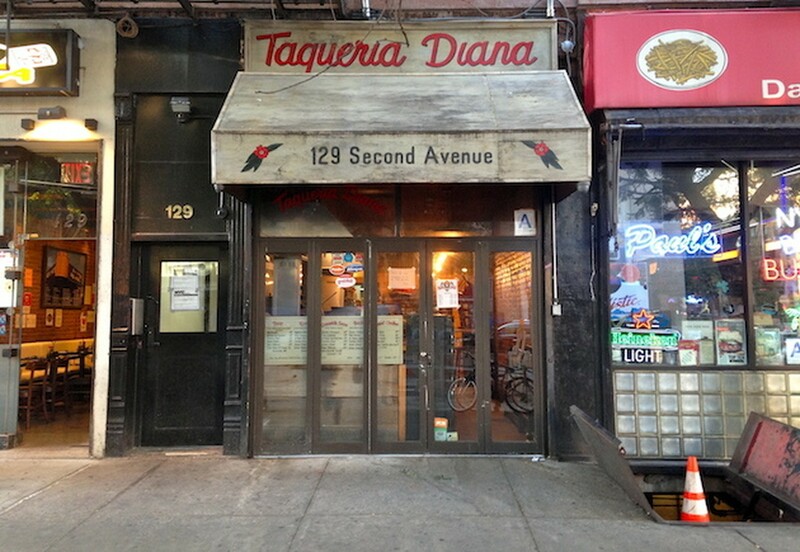 The tacos at Diana are bueno, but they're not the real story here. Our favorites are the Rajas, better known to los gringos as roasted Poblano peppers and corn. I ordered a quesadilla along with an order of nachos once. How did that turn out? I've still never had a quesadilla here.